Interscan, a microwave approach and landing system for aircraft, was born out of wartime work done in secret by the CSIR Radiophysics Laboratory on radar. When Paul Wild was appointed Chief of the Division of Radiophysics in 1971, he took the opportunity to respond to an invitation by the International Civil Aviation Organisation (ICAO) to Member States, to design and construct a microwave landing system (MLS) for aircraft. Wild assembled a small team to propose and develop a new system with financial support from the Commonwealth Department of Transport. Other competing groups were three large teams in the USA and groups from the UK, France and Germany. 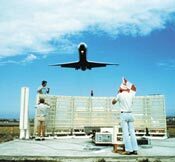 Wild, who had an outstanding grip on the basic principles of physics, was quick to come up with a time-reference scanning-beam system as a possible solution to the MLS; this was called ‘Interscan’ which in 1978 was selected by ICAO as the winning entry. It was developed in collaboration with the US as the Time Reference Scanning Beam/Interscan system and had the advantage that while the guidance signal format was common in the US and Australia the ground equipment used to generate it was different in the two countries. While MLS has been adopted in Europe as replacements for ILS, in the United States, the FAA halted further development of MLS in 1994 to consider the use of technology based on the global positioning system (GPS) instead of, or in addition to, existing microwave systems. One of the most difficult tasks a pilot has to perform is to achieve a smooth and safe landing. Early pilots landed on an open field, facing any direction that gave them the best angle relative to the wind. But as traffic grew, and more aircraft began to use airports rather than farms or fields, landings became limited to certain directions. Landing aids were developed to help pilots find the correct landing course and to make landing safer. These landing aids included: rotating lights, commenced in the 1920s, enabling landing fields to be found after dark; approach lighting (in the early 1930s), that indicated the correct angle of descent and whether the pilot was right on target. Gradually, the colours of the lights and their rates of flash became standard worldwide based on International Civil Aviation Organization (ICAO) standards. The introduction of the slope-line approach system was a first in landing aids. Developed in the 1940s, the aid consisted of lights in rows that showed the pilot a simple funnel of two rows that led him to the end of the runway. Other patterns showed him when he was off to the right or left, or too high or low. The system was inexpensive to build and operate although it had some limitations and was not suitable for certain airports. Radio navigation aids also assisted in landing. One type, introduced in 1929, was the four course radio range, where the pilot was guided by the strength of Morse code signals. Another type that was tried experimentally was the low-frequency radio beam where radio beams flared outward from the landing point like a ‘v’, so at the point farthest from the runway, the beams were widely separated and it was easy for the pilot to fly between them. However near the landing point, the space between the beams was extremely narrow, and it was often easy for the pilot to miss the exact centerpoint that he had to hit for landing. Another new method had a pilot tune into a certain frequency at a checkpoint far from the airport, then use a stopwatch to descend at a precise rate to the touchdown area of the runway. This method also proved difficult. The Instrument Landing System (ILS) incorporated the best features of both approach lighting and radio beacons with higher frequency transmissions. The ILS painted an electronic picture of the glideslope onto a pilot’s cockpit instruments. Tests of the system began in 1929, and the Civil Aeronautics Administration (CAA) authorised installation of the system in 1941 at six locations. The first landing of a scheduled US passenger airliner using ILS was on January 26, 1938, as a Pennsylvania-Central Airlines Boeing 247-D flew from Washington, DC, to Pittsburgh and landed in a snowstorm using only the ILS system. While more than one type of ILS system was tried, the system eventually adopted consisted of a course indicator (called a localiser) that showed whether the plane was to the left or right of the runway centerline, a glide path or landing beam to show if the plane was above or below the glide slope, and two marker beacons for showing the progress of approach to the landing field. Equipment in the airplane allowed the pilot to receive the information that was sent so he could keep the craft on a perfect flight path to visual contact with the runway. Approach lighting and other visibility equipment are also part of the ILS and aid the pilot in landing. In 2000, at the start of the new millenium, the ILS remained basically unchanged. it cannot be used to guide aircraft on precisely defined segmented or curved approaches to the runway. At busy airports such approaches are increasingly needed to facilitate the control of the terminal traffic and to avoid noise-sensitive areas or terrain obstructions. it cannot be used by vertical take-off and landing (VTOL) or by short take-off and landing (STOL) aircraft which descend at angles steeper than 3°. it is quite sensitive to reflections from terrain and buildings which disturb the course and may make it unflyable. ILS operates in the VHF frequency band and large, flat areas are needed to obtain a satisfactory performance. Very costly earthworks may be required and at some airports ILS cannot be made to work. These and other shortcomings motivated the International Civil Aviation Organization (ICAO) to recommend to Member States the development of a new system that can serve international civil aviation to the end of the century and beyond. ICAO is a specialised agency of the United Nations responsible for the international standardisation of aircraft guidance systems. Australia is one of the member states of ICAO of which there were 190 in 2011. By the early 1960s the Australian Department of Transport, along with other aviation administrations having been involved in several upgrades of ILS, concluded that an entirely new system was required with a new signal format and radio frequency operating at 5 000 MHz or higher rather than the 110-33-MHz range used for ILS. The new system became known as the Microwave Landing System (MLS). In the early 1960s the US had been studying alternative landing systems and by the mid 1960s had tested a complete MLS as had the UK. As these and other MLS developments had been proceeding independently and with quite different objectives, the Australian Department of Transport was concerned that such uncoordinated efforts were not in the best interests of international civil aviation. They believed that ICAO should coordinate such developments and at the April 1967 meeting of the All Weather Operational Panel (AWOP) proposed that ICAO commence studies of the development of a new system to replace ILS. ICAO were not receptive to this suggestion and it took another two years until, in late 1969, they finally agreed to the study and gave AWOP the task of producing an Operational Requirement (OR) for the new system and a proposed program of development. The Australian Department of Transport actively participated in this task. The recommendations for the OR and the development program were agreed internationally by ICAO in 1972. There was to have been no competition. ICAO invited Member States to develop new systems in a spirit of cooperation, with the interests of international civil aviation foremost in mind. Co-operation was indeed achieved in developing the operational requirements a new system had to meet and in framing system evaluation criteria. However these requirements could be met in many ways; system designers were deliberately left much latitude and inevitably competed with each other. When Australia decided in 1973 to develop a system for submission to ICAO, she entered into a contest with some of the world’s most advanced technologies: the USA, the UK, France and the Federal Republic of Germany. Since ICAO did not have the resources to undertake the development of the new system, it invited its member states to submit proposals to the All Weather Operational Panel (AWOP) who had the responsibility for screening, assessing and suggesting further tests and as well as having the responsibility to prepare the final recommendation for an ICAO standard microwave landing system. Through its active participation in the US and ICAO MLS programs thus far the Australian Department of Transport had gained valuable information and insight into MLS design, but had no particular system in mind as the optimum. When Paul Wild was appointed Chief of the Division of Radiophysics in 1971, he held discussions with the Department of Transport on applied research projects in the aviation field. During these discussions the Department of Transport representatives reviewed the MLS developments and in particular that the US had reluctantly dropped what promised to be a superior scanning beam system ‘ Time Reference Scanning Beam ‘ because there was no suitable antenna available. The vertical profile of an azimuth reflector was shaped by synthesis techniques to produce a very sharp cut-off along the ground and an optimum shape at other vertical angles. The technology developed for the new surface of the Parkes radio telescope was directly applicable to all the reflector antennas for Interscan. Interscan is based on a system of microwave beams which scan to and fro across the sky. By measuring the time interval between the two pulses received in the aircraft during each ‘to and fro’ scan of a beam, the angular position of the aircraft relative to the runway can be determined. This is the time-reference scanning beam (TRSB) technique pioneered in Interscan. One beam scanning in a horizontal plane gives the angle from the runway centre line; a second beam scanning vertically provides the elevation angle. Distance-measuring equipment (DME) in the aircraft determines the distance to a point on the runway and, in the final landing stage, a third beam provides precise height. All this information is processed by an on-board computer to give the pilot his position twenty times a second. DME was developed by the CSIRO radar group in 1945 at the end of the second World War (see Radar). The Department of Transport realised that Australia’s Interscan bid was up against considerable opposition and from previous experience knew that technological diplomacy would also be required if the bid were to succeed. The best way to proceed was to ensure that the principles of Interscan were embodied in the finally selected system. Rather than confront all comers ‘head-on’ with the high probability of failure, Australia decided to work with the US as it moved towards selecting its own system. If the US could be convinced of the superiority of Interscan and were to select a system based on its principles then the US and Australia would be a powerful force in the ICAO selection process. Australia therefore proceeded to demonstrate the superiority of Interscan to the US. A high level US technical mission visited Australia in 1974 and were favourably impressed by the presentations and demonstration. The problem however was to demonstrate it in the US and thus bring it into the US evaluation. Providing equipment to the US was impractical given Australia only had an experimental prototype at this time. The more convincing strategy was to demonstrate that Interscan would work on modified US equipment. As a result in a US/Australia collaboration one of the US scanning systems was modified to transmit the Interscan signal format and an Australian receiver was used for the flight tests. Thus the first flight tests of Interscan were in the US in mid 1974 in a US aircraft at Atlantic City, New Jersey, not in Australia. The tests demonstrated the superior characteristics of Interscan over the competing Scanning beam (US) and Doppler (UK) systems. At the end of 1974 the US selected a system which incorporated all of the essential features of Interscan as the US system for presentation to ICAO. They called the system by its generic name, Time Reference Scanning Beam (TRSB). Australia and the US now collaborated closely on MLS development and given the concepts in the two systems were now the same, AWOP agreed to deal with them jointly as TRSB/Interscan. While the guidance signal format was common the ground equipment used to generate it was different in the US and Australia. This was seen to be an advantage not a disadvantage because it demonstrated the diversity of equipment that could be employed for its implementation. Interscan was demonstrated to an ICAO Working Group at Melbourne Airport in March 1975 and the pilot put his aircraft down only 60 centimetres from the tarmac centre line. All the systems proposed were evaluated by AWOP who in February-March 1977 selected TRSB/Interscan as the signal format to be recommended to a worldwide meeting of all ICAO member states in April the following year, for international adoption. Over the ensuing period intense activity followed as the proposing states carried out further demonstrations of TRSB/Interscan and Doppler respectively. Interscan was installed and trialled at Sydney airport, which represented a severe test of any MLS. An invitation by Australia to the UK to subject their Doppler system to a similar trial was declined. The worldwide meeting of ICAO (called the All Weather Operations Divisional Meeting), took place in Montreal in April 1978 and was attended by 71 of the ICAO member states. At the beginning three systems were to be considered but following discussions the Federal Republic of Germany decided to withdraw and support TRSB/Interscan. After three weeks of debate, the meeting voted 39 to 24 with 8 abstentions to recommend TRSB/Interscan rather than the UK’s Doppler system, to the Council of ICAO for international standardisation. MLS have been adopted in Europe as replacements for ILS. In the United States, however, the FAA halted further development of MLS in 1994. Instead, the FAA is considering the use of technology based on the global positioning system (GPS) instead of, or in addition to, existing microwave systems. The GPS uses satellites for navigation between airports and is exceedingly precise.